Developer Auroch Digital and publisher Ripstone Games have set a release date for the Switch version of Achtung! Cthulhu Tactics. The turn-based strategy game launches January 24, the two sides confirmed today. Based on the hugely popular tabletop RPG from Modiphius Entertainment, Achtung! 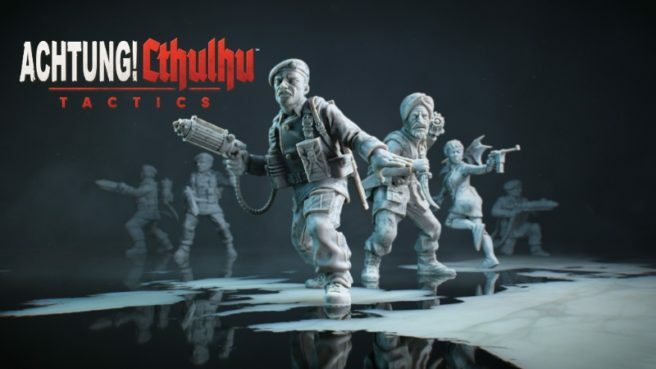 Cthulhu Tactics is an occult turn-based strategy game pitting players against a rogues’ gallery of Lovecraftian beings controlled by the Nazis. You’ll have to use your cunning military tactics, along with some nifty supernatural powers, to save the world. Set in an alternate history of World War II where the Nazis’ investigations into the occult have resulted in the summoning of Lovecraftian monsters, you’ll have to take the reigns of Charlie Company, an elite band of allied forces sent in to do the impossible; foil the Nazi plans and turn the tide of war. – Tactical Combat: direct a squad of allied heroes in innovative turn-based ground battles. – Momentum System: perform well in combat by racking up kills and executing critical hits to earn Momentum and turn the tide of battle in your favour. – Light vs Dark: harness the power of the light to expose and suppress the spawn of Cthulhu hiding in wait in the oppressive darkness. – AP System: every decision is important and the Action Point System gives you the flexibility to put as much emphasis into heavy combat or nimble movement as you like. – Psychological System: witness too many horrors of war and watch as your unit’s sanity begins to unravel mid-fight. – Build Your Team: characters have unique skills that can be unlocked and levelled up in different ways, and weapons can be modified to give a variety of benefits. This lets you customize your squad to better vanquish Nazi scum. – Weird World War: explore the Lovecraft-meets-WW2 universe of Achtung! Cthulhu like never before with Mythos-inspired enemies and a story-driven campaign handcrafted by John Houlihan which ties directly into the pen and paper roleplaying game narrative. Achtung! Cthulhu Tactics will cost $24.99 / £19.99 / €24.99 on the Switch eShop.